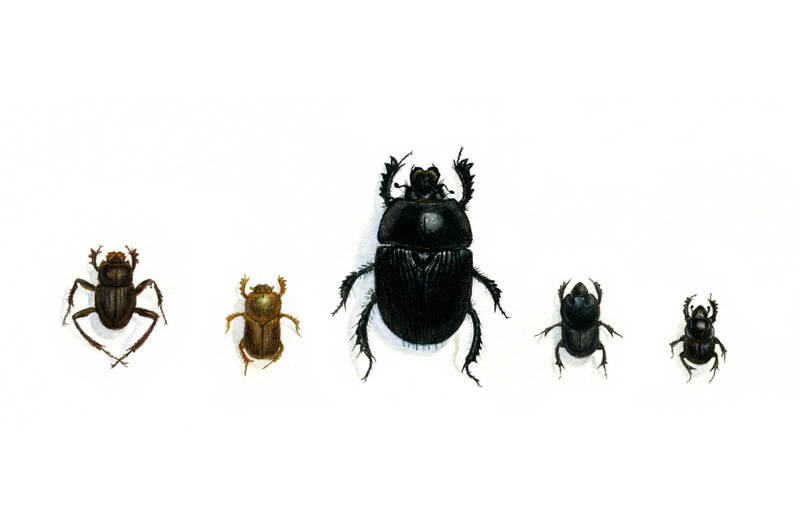 You are here: Home / Dung Beetle Information / What are Dung Beetles? In short, a dung beetle is a beetle whose larvae feed on dung. In detail, dung beetles are beetles that feed partly or exclusively on faeces (dung). A dung beetle can bury dung 250 times heavier than itself in one night. Many dung beetles, known as rollers, roll dung into round balls, which are used as a food source or breeding chambers. Others, known as tunnelers, bury the dung wherever they find it. A third group, the dwellers, neither roll nor burrow: they simply live in manure. They are often attracted by the dung collected by burrowing owls. Here are some dung beetle facts that will assist you in understanding what dung beetles are. Fact: Dung beetles live in many different habitats, including desert, farmland, forest, and grasslands. They do not prefer extremely cold or dry weather. Fact: They are found on all continents except Antarctica. Fact:One type living in South America, Deltochilum valgum, is a carnivore preying upon millipedes. Those that eat dung do not need to eat or drink anything else, because the dung provides all the necessary nutrients. Fact: One type living in South America, Deltochilum valgum, is a carnivore preying upon millipedes. Those that eat dung do not need to eat or drink anything else, because the dung provides all the necessary nutrients. Fact: Most dung beetles search for dung using their sensitive sense of smell. Some of the smaller species simply attach themselves to the dung-providers to wait for their reward. Fact: After capturing the dung, a dung beetle will roll it, following a straight line despite all obstacles. Sometimes dung beetles will try to steal the dung ball off another beetle, so the dung beetles have to move rapidly away from a dung pile once they have rolled their ball to prevent it from being stolen. Fact: Dung beetles can roll up to 50 times their weight. Male Onthophagus taurus beetles can pull 1,141 times their own body weight: the equivalent of an average person pulling six double-decker buses full of people. In 2003, researchers found one species of dung beetle (the African Scarabaeus zambesianus) navigates by using polarization patterns in moonlight. The discovery is the first proof any animal can use polarized moonlight for orientation. Fact: The “rollers” roll and bury a dung ball either for food storage or for making a brooding ball. In the latter case, two beetles, one male and one female, will be seen around the dung ball during the rolling process. Fact: Usually it is the male that rolls the ball, with the female hitch-hiking or simply following behind. In some cases the male and the female roll together. When a spot with soft soil is found, they stop and bury the dung ball. They will then mate underground. Fact: After the mating, both or one of them will prepare the brooding ball. When the ball is finished, the female lays eggs inside it, a form of mass provisioning. Some species do not leave after this stage, but remain to safeguard their offspring. Fact: The dung beetle goes through a complete metamorphosis. The larvae live in brood balls made with dung prepared by their parents. During the larval stage, the beetle feeds on the dung surrounding it. “I ask myself in vain what Proudhon introduced into Scarabaean morality the daring paradox that “property means plunder”, or what diplomatist taught the Dung-beetle the savage maxim that “might is right”.